Six years ago For All We Know’s self titled debut album was released. Afterwards the urge to write and release more of his own music was very strong, so Jolie started working on his second album Take Me Home. For the music and lyrics of the album Jolie collaborated with vocalist Wudstik. The band consists of the same main musicians that played on the first album; Léo Margarit (Pain of Salvation), Kristoffer Gildenlöw (ex Pain of Salvation), Marco Kuypers (ex Cloudmachine) and Thijs Schrijnemakers (Orgel Vreten). As guest vocalist on Take Me Home, the amazing Anneke van Giersbergen is featured. During the last five years this album was created both when Jolie was on the road with various bands (Within Temptation, The Gentle Storm, Maiden uniteD, etc.) and in his own studio in the Netherlands. The 12 songs range from dark, atmospheric and dreamily acoustic to bright, heavy and pounding progressive metal tracks and were produced by Jolie himself. In comparison to the first album, Take Me Home takes things more into the extremes; heavy songs are heavier and softer songs are softer; and everything in between of course. 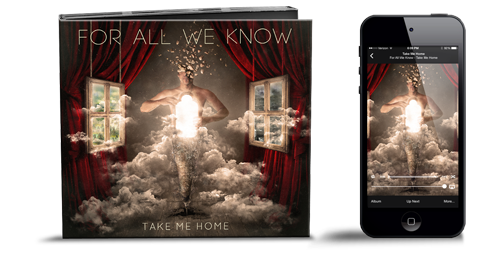 In early summer 2017 For All We Know’s “Take Me Home” was very successfully crowdfunded. On Indiegogo €12.849,- was raised. That was 143% of the campaign goal. Take Me Home will be available as digipak CD and as digital download on all major platforms.